I’ve heard great things about Ken Symons’ cooking at his restaurant, Oliver’s, and have been wanting to visit for some time. 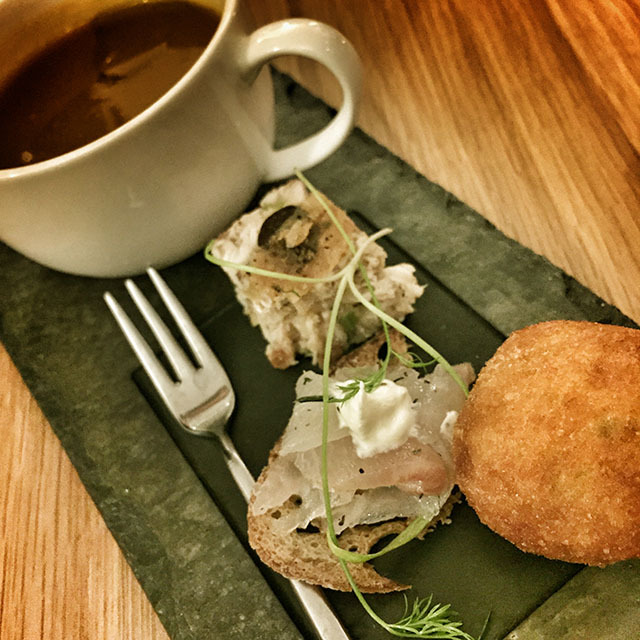 I was invited to enjoy a five-course tasting menu at an event organised by the Social Dining Network. Easy to miss, the little bistro is tucked between shops on Falmouth High Street. Owned by Ken and his wife, Wendy, it is relaxed and unpretentious, and was comfortable and cosy on a cold January night. From the moment we entered, Wendy, who runs front of house, and her attentive staff made us feel so welcome. We had hardly had time to sip our Prosecco when we were handed small slates with our own personal selection of canapés (pictured above): a cup of warming butternut squash soup; a wafer thin crostini topped with a sliver of wild bass gravadlax; a cube of soft belly pork and a ball of warm, cheesy goodness (halloumi and something magical were contained within). With pre-dinner snacks like this, we know we were in for a treat, and the first course (below) certainly didn’t disappoint. 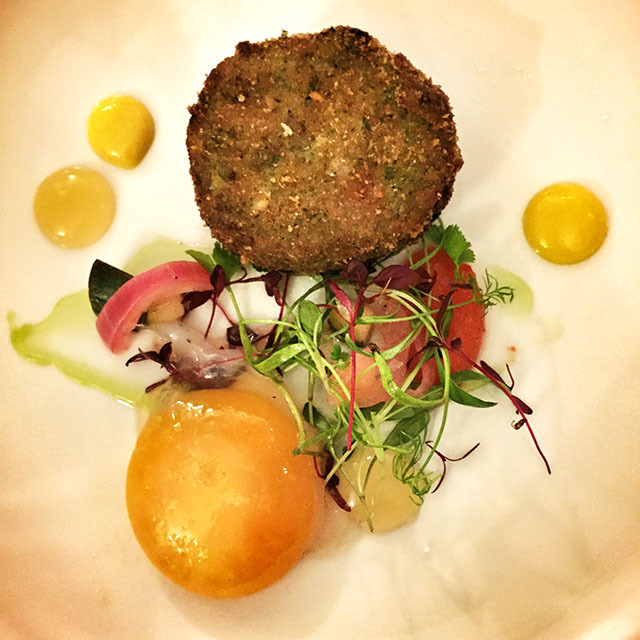 Warm ham hock was encased in herbed crumb and fried, to give a crispy coating which gave way to a centre of juicy pink meat. The confit duck yolk was cooked to perfection, and the rich bright yellow liquid oozed across the plate. This was complemented by the fresh watercress purée and little pieces of brightly acidic pickled cucumber. 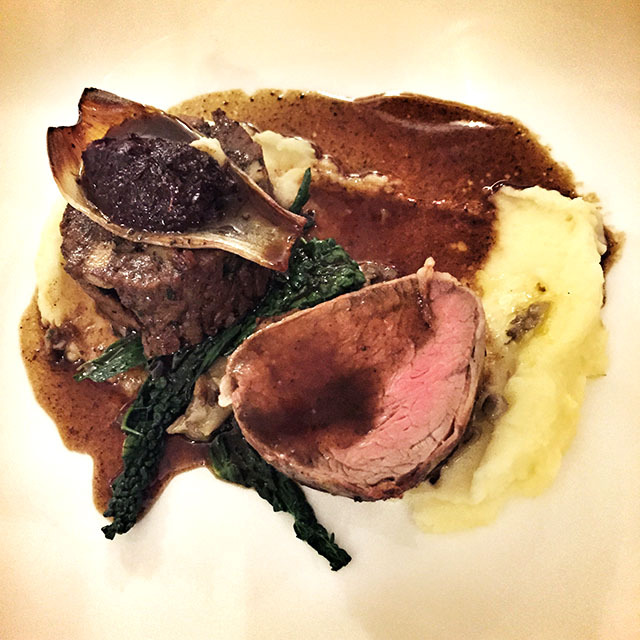 Time for the main course (above), and wow, it was a good one: 24 hour braised beef shin, roast fillet of beef, pancetta, shallot, mushroom and horseradish mash. This was so generous – either one of the melt-in-your-mouth shin or soft-as-butter fillet would have sufficed, but I wasn’t going to complain. Rich and savoury, every element on the plate had been carefully considered so that each mouthful was perfectly balanced. The sharpness of the horseradish cut through the rich sauce. Sweet shallot countered savoury beef shin, little pieces of mushroom and pancetta gave even more texture. We were getting full by this point so I was glad to see that the next course (above) was a little smaller. But it certainly packed a punch. A mini New York cheesecake topped with marzipan and honeycomb, with fig reduction and a small scoop of ice cream. There were the super sweet elements of fig and honeycomb, and the salty cheesiness that you only get with a proper cheesecake. The addition of marzipan lent another layer of flavour to this delicious dessert. The grand finalé was a chocolate extravaganza (above). 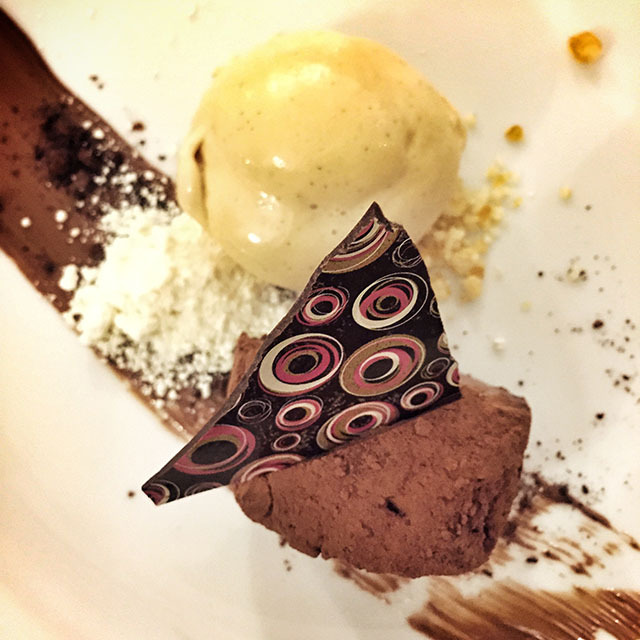 A chocolate crémeux (like a fluffy, smooth, light truffle – I suggested Ken rename it fluffle, but I don’t think he was keen) with white chocolate powder, macadamia nuts, a shard of patterned, dark chocolate and a scoop of exceedingly good caramel ice cream. I’m a sucker for all things chocolate, so this was the perfect ending to a delightful meal. 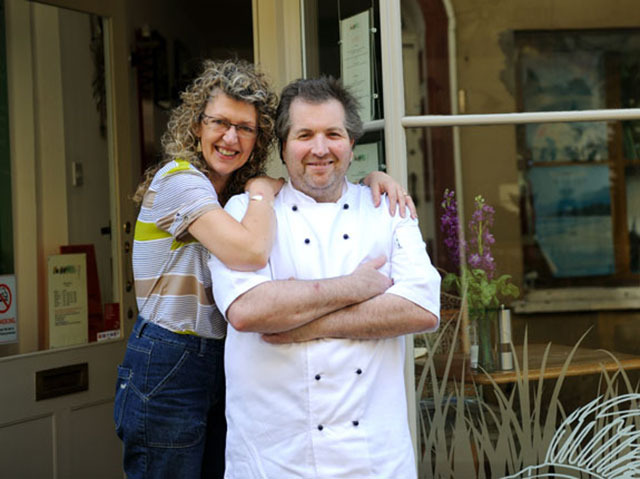 Ken and Wendy’s passion for food and hospitality shone throughout the evening, and I wouldn’t hesitate to recommend Oliver’s to anyone who enjoys the finest ingredients, cooked with imagination and flair. Generally, a set menu is available at lunchtime (2 courses £13.95, 3 courses £19.90), and à la carte and tasting menus (4 courses £25, 7 courses £38) during the evenings. Menus change daily. A monthly six course tasting menu night is normally sold out months in advance (£50 including wine flight). For more information visit their website. 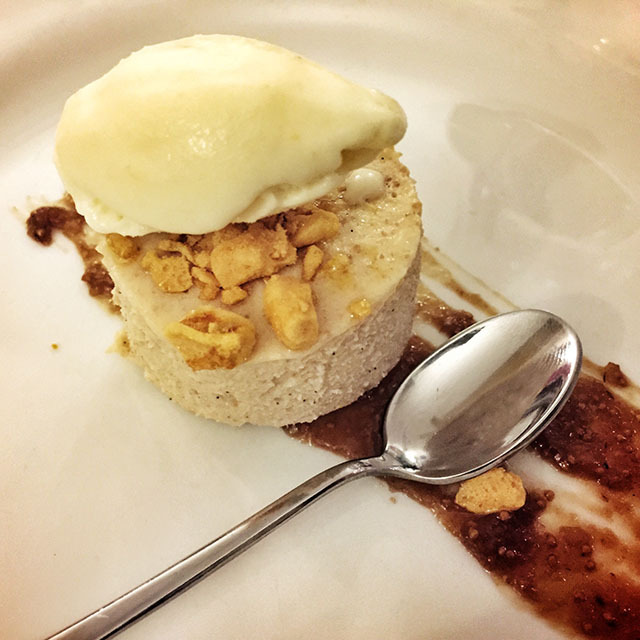 The Social Dining Network meets regularly at restaurants across Cornwall and is a chance for like-minded food lovers to meet. Thank you to Andy for inviting me to this event, and to the members of the club for their good company during the evening. For more details about upcoming events please visit www.socialdiningnetwork.com.